Whenever you send a mailing that contains images, there is a good possibility your email will end up being read by someone who has the images turned off. Most email clients default to images off, and many people leave it this way. That’s why it is always a good idea to include an alt tag that tells people what they’re missing. A good alt tag will inspire people to turn on the images. Images without alt tags are wasted opportunities. Here is the same image sent two different ways. The example on the left is an ordinary alt tag, while the image on the right uses the code shown above. The styled information is missing because it is too long to fit on one line. In Chrome and Safari, if an alt tag is too long to fit on one line, it does not appear at all. This also is true for alt tags without style information, but, as you can see, the alt information fits without a problem as long as it isn’t styled. By increasing the font size, we’ve caused the text to wrap and disappear. The same thing happens on iPhones and Android phones. By far, the least friendly applications when it comes to styled alt tags are the email viewing options offered by Microsoft. 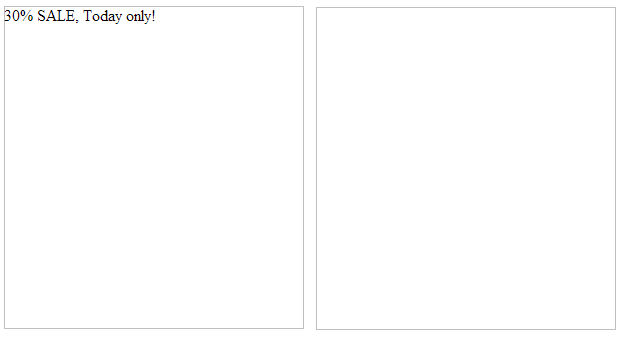 In Hotmail and Outlook.com, for instance, an email with the images turned off displays gray boxes with neither cell colors nor alt tags, styled or otherwise. In Outlook and Outlook Express, all styling is eliminated and every alt tag is prefaced with a statement about the protection of privacy. In Internet Explorer, styled alt tags viewed on non-Microsoft client sites keep the color information, but all other font characteristics are lost. Opera will display styled alt tags, but, like Safari and Chrome, lines that are longer than the box width do not display properly. Unlike those browsers, however, Opera displays whatever text will fit the width of the box and the rest disappears off the right side of the image box. To help you decide whether or not you want to use styled alt tags, we’ve constructed the following chart, that shows how the various clients, applications and browsers handle images and alt tags. Based on the data in the chart, the most useful feature of styled alt tags is the ability to assign a color value to an alt tag, especially if most of your recipients are using Internet Explorer. It is the one style attribute that gets delivered across the most browser platforms. If you have alt information for a cell with a dark background color, adding style=”color: rgb(255, 255, 255);” to the IMG tag will help make the alt information visible. Here are two examples. In the box on the left, the alt tag has no style information. You can see that even though the cell color is slightly lighter than the one used for the styled alt tag, the alt information is difficult to read. The example on the right has the color attribute shown above added and is much easier to read. 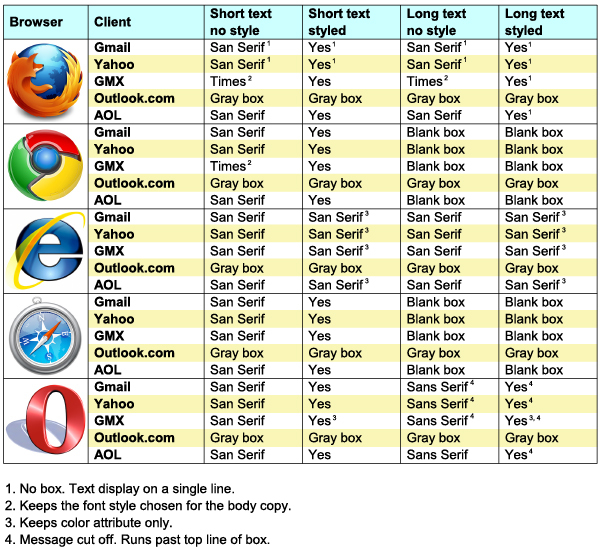 The appearance of the text changes from browser to browser, so the alt tags should be checked by sending your test emails to one or two people who have access to the various browsers of various email clients. This is the surest way to check that your tags are viewable across various email clients and browsers. If you want to make the text appear larger, or in some other typeface, you’ll need to keep in mind that not everyone will be able to see your handiwork. Using styled alt tags is a great way to add pizzazz to your email. As long as you are careful about the length and you test the email’s appearance across various browsers, there is really no downside to using them. The set-up is minimal, and you can always copy and paste the HTML information from previous emails once you’ve decided on styling attributes you want to use on a regular basis. If a substantial number of recipients are using Chrome and/or Safari, you’ll need to make sure that your alt tags are kept short and that any styling does cause the text to wrap. Also keep in mind that, as attractive as they are, they are not a substitute for actual text in the email (see Using Text to Deliver Your Message). Want to learn more about how to use text and images in your email for maximum deliverability and effectiveness? Then check out our new white paper, Using Text and Images. 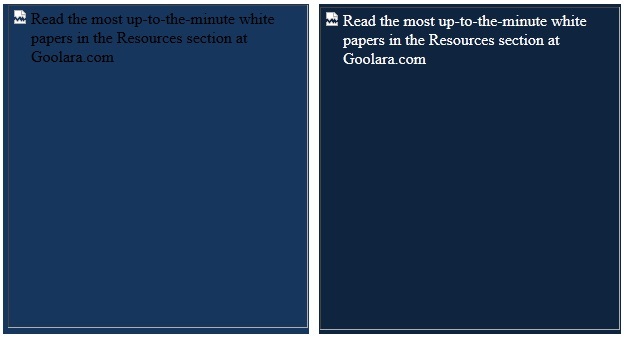 Available in the Resources section of the Goolara website. Click here for a direct link. This entry was posted in Design, Email marketing, Trends and tagged alt tags, browsers, HTML on January 24, 2013 by Jim Morton.